Two years after a Twitter scandal, is this a bold comeback attempt or the height of chutzpah? NEW YORK — A bold comeback attempt or the height of chutzpah? In what could be the start of one of the most intriguing second acts in American politics, Anthony Weiner, the congressman who tweeted himself out of a job two years ago with a photo of his bulging underpants, is considering jumping into the New York City mayor’s race. “I do recognize, to some degree, it’s now or maybe never for me,” Weiner, 48, said in a long and highly personal profile that he clearly hoped would be the start of his rehabilitation. But are voters ready to forgive? Will they at least stop giggling long enough to hear what he has to say? Political analysts say Weiner would face a steep climb to get past his past, but his political skills, his rich reserve of campaign money and the dynamics of a crowded Democratic primary could make him a player, if not a clear winner, in the contest this fall to succeed Michael Bloomberg as mayor of the nation’s largest city. Known as a congressman for his in-your-face style, he could punch up the forums and debates. And he certainly doesn’t lack for name recognition, for better or worse. But Weiner’s problem could be less about what he exposed than about his attempts to cover it up. “People will say, ‘Why should we trust him again? He lied to us before — he’ll lie to us again,'” said veteran New York Democratic political consultant George Arzt, who isn’t working with any candidates in the mayoral race. Weiner’s downfall came in 2011 after a photo of a man’s underwear-clad crotch appeared on his Twitter account. The seven-term congressman first claimed his account had been hacked. Then he denied sending the picture but told reporters he couldn’t say for certain whether it was a photo of him. As more pictures surfaced, including one of Weiner posing shirtless in his congressional office, the married congressman was forced to come clean and acknowledged exchanging inappropriate messages with several women, though he said he never met any of them. He resigned within weeks. If not the biggest scandal in U.S. politics, it was perhaps one of the most cringeworthy. Weiner and his wife, Huma Abedin, a longtime aide to former Secretary of State Hillary Rodham Clinton, said they sought the magazine interview to show voters he is a changed man: He entered therapy soon after the scandal broke and has spent most of his time as caregiver to the couple’s 13-month-old son, Jordan. Abedin told the Times she struggled to forgive her husband. “I did spend a lot of time saying and thinking: ‘I. Don’t. Under. Stand.’ And it took a long time to be able to sit on a couch next to Anthony and say, ‘OK, I understand and I forgive,'” she said. Americans have proved willing to forgive politicians many misdeeds. Former South Carolina Gov. Mark Sanford, who turned “hiking the Appalachian Trail” into a euphemism for an affair, is on the road to redemption, having won the Republican nomination for his old seat in Congress. Other Democratic candidates greeted the prospect of a Weiner candidacy with restraint Wednesday, with several saying they would welcome him to the contest. City Council Speaker Christine Quinn, who has led the Democratic pack in polling, said only that Weiner’s decision was up to him and his family. If Weiner gets into the race, he would have a campaign fund of more than $4.3 million and the possibility of nearly $1.5 million more in public matching funds. With several Democrats vying for the nomination, it’s far from clear that any of them could emerge with the 40 percent needed to avoid a runoff. 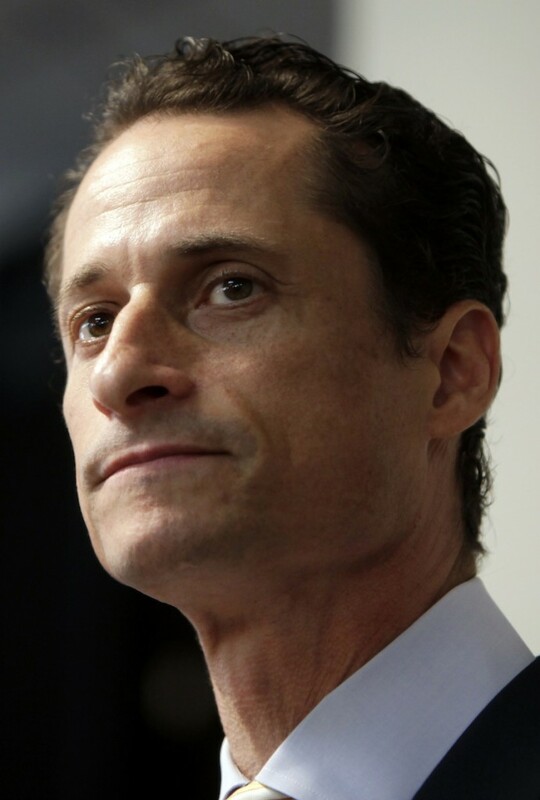 Some observers think Weiner could at least make it to the second round. His candidacy could prove a headache for both the Democratic Party and his rivals. “His issue becomes the issue — it will begin to overshadow aspects of this race,” said Democratic former state Assemblyman Michael Benjamin, now a political consultant. “And it brings up the quality of Democrats who are running for public office” to an electorate already cynical about politicians, he said. For some voters, Weiner would be asking too much. “He isn’t a very smart guy, based on what he did. He can be swayed to do the wrong thing,” said Dave Smith, a construction worker.